Contact our PartyMojo office at 65696992 / Sales 81606655 / Yolanda 81606622 to enquire now! Drop us a quick email at [email protected] today for your very own Cross Cut Sandwiches Station! Remember the last time you had to hurry for a meeting or class and there was no time to get lunch? Your most natural reaction would probably be to grab a sandwich on the go and carry on with what you had to do. Simple and convenient, wasn’t it? The most basic and classic of them being the ham and cheese sandwich. Something so cliche yet something we can’t live without. Regardless of the many variations of sandwiches out there, your love for sandwiches never died. We’ve heard you and we are delighted to serve you your favourite cross cut sandwiches from our live stations! 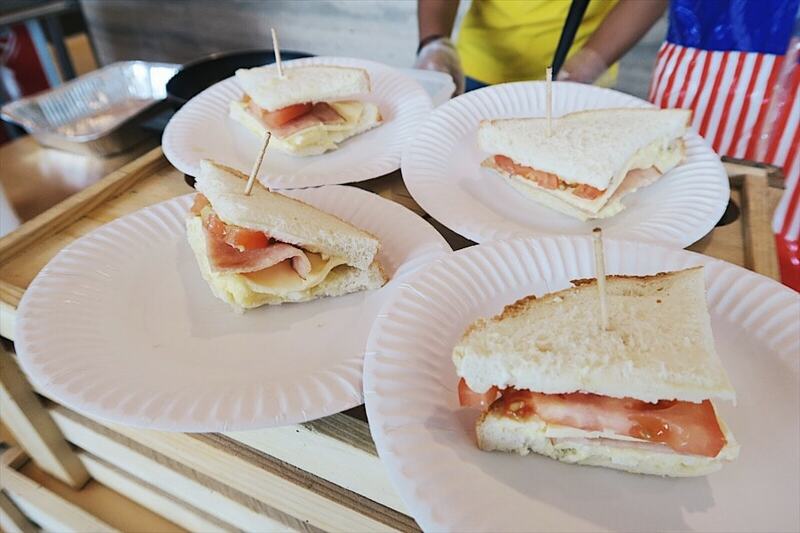 Craving for some sandwiches in your events? Don’t worry, we got it all covered for you with our Cross Cut Sandwiches Station! What’s required from me if I hire PartyMojo’s Cross Cut Sandwich Station? Simply provide us a table and we’re good to go! Cross Cut Sandwiches at your events! Don’t ever underestimate the sandwich. Sure it’s a really simple creation but ever wondered how much could be packed into just one little sandwich? Something so small and compact could contain almost everything your body needs – lettuce and tomatoes deliver the dietary fibres and anti-oxidants while the meat meets your needs for omega-3, protein and healthy fats. It’s just crazy, isn’t it? Just one bite of the contents between two slices of bread and your body receives so many different nutrients! Have a better reason to cater sandwiches for your next event now? Well, contact PartyMojo today to ask about getting our Cross Cut Sandwiches Stations! How are cross cut sandwiches served? Want your sandwiches to taste as fresh and fluffy as how you have it from Subway? Here at PartyMojo, we make sure the ingredients for your sandwiches were just harvested from the farm! Well, not quite but you definitely sense our dedication to preparing the freshest ingredients for your consumption! The various choices of meat and vegetables will be prepared beforehand, sealed and frozen before being transported to your event. Our professional Mojo staff will then make your sandwiches right before you at the Cross Cut Sandwiches Station. Contact PartyMojo today to get our Cross Cut Sandwiches Station for your next event! Why have Cross Cut Sandwiches Station at your event? The cross cut sandwich is indeed an all-time-favourite that people consume as one of their daily staples. It suits almost your every need! Just craving a light snack? Grab a sandwich! Utterly famished? Grab bigger and more sandwiches! Need to walk around a party to entertain your guests? Take a sandwich with you! A sandwich is satisfying, mobile and great for you if you need food while multitasking with socialising or working. Contact PartyMojo today to find out how much our Cross Cut Sandwiches Station can achieve for you! Fun fact on Cross Cut Sandwiches! The fourth Earl of Sandwich was an avid gambler who refused to take time to have meals during his long card games and would ask his servants to bring him slices of meat held between two slices of bread. This practice soon became popular among his fellow gamblers and therefore, the sandwich was born. The sandwich was clearly created for convenience and efficiency. What better way to help your busy guests with their meals while they are all caught up with mingling at the party? Get them sandwiches of course! Enquire with PartyMojo today at 6569 6992 or 6569 6998 about catering your all-time favourite cross cut sandwiches served by our Cross Cut Sandwiches Station!